Painting can be intimidating especially if you are not doing step-by-step class and your creativity has to be unleashed from the soul. 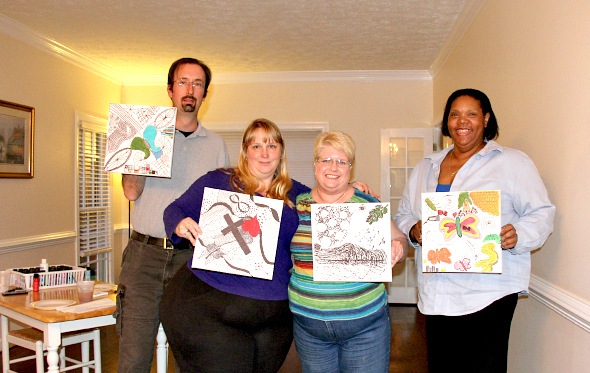 That was the point of our most recent PAINT NIGHT involving ZENTANGLES. Most of our PAINT NIGHT classes are based on easy to follow guided work. This time we encouraged participants to meditate on the strokes they wanted to express. We combined the practice with mediation music and aromatherapy to give everyone a very ZEN environment. Check out our calendar and register for our upcoming events! ArtInspired is located in Newport News and Yorktown, VA. We are an Open Arts Space that features classes in Wellness, Creativity, Photography and more… We also have services to make your life more inspired and FREE WEEKLY POWER TALKS to encourage you to live a more positive life.